Almost wordless: A few weeks ago these little guys were all over my yard gathering up spilled seed under the bird feeders. Now it’s a frozen wasteland outside and the chipmunks are hibernating under my deck. You should fly him and his family down here to Texas. Lots of nice sunshine and seeds! Awww! I absolutely love chippies! We have some that live here too! 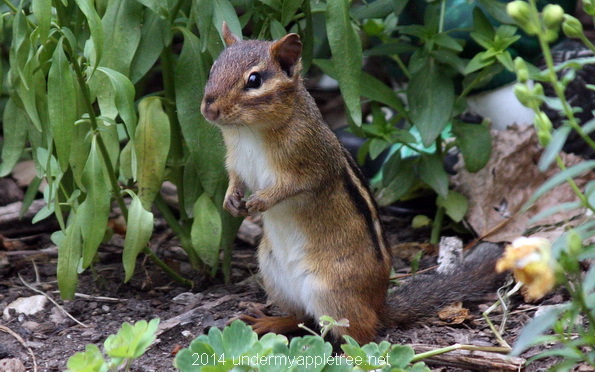 We have chipmunks too. He’s a cutie. I miss chippies, they’re so cute! We don’t have them here, probably because there are so many cats in the neighborhood. So cute! Wonderful photo, as always! Such a cute little guy. I suppose they burrow under the ground in winter?